A little knowledge goes a long way. Econx automatically monitors all of your home’s security and automation functions. It tracks and measures performance and activity, and presents valuable information in simple visual formats, and easy-to-follow logs and read-outs. By understanding how your smart-home is behaving you can make the smart decisions, and always stay in control. 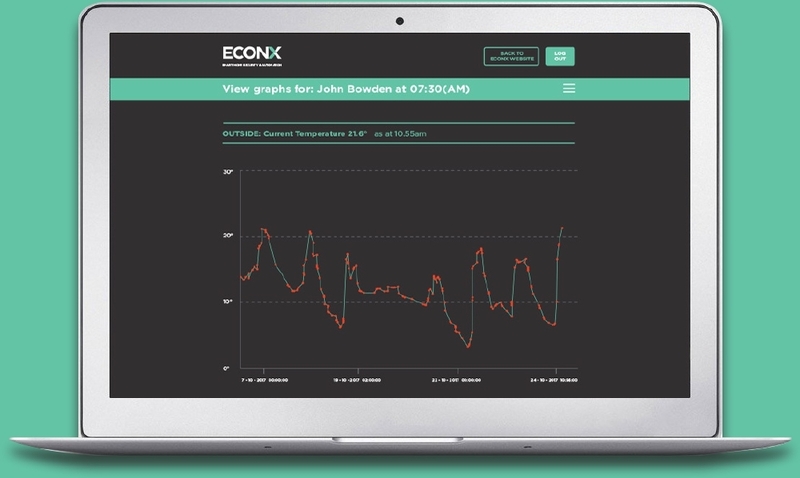 The Econx system’s monitoring function is a fantastic benefit that allows you to adapt and fine-tune how your system runs your home. It automatically graphs performance, records activity, and lets you know what’s happening and when. The Econx recording capabilities and hyper-functionality mean you can check your home’s security features and make the decisions that make your home just the way you like it, whenever you like. • Simply access Econx online from your laptop, tablet or desktop computer to view any aspect, then manage your home to suit your lifestyle. • Keeping your home and your family safe are a priority. By checking your alarm logs you can see which doors, gates and garage doors have been accessed at any given time, and by whom, if you’ve assigned secondary users to your system. • Econx also provides a record of when any alarms were triggered and allows you to review security footage and check time logs. • You can keep your home and family comfortable all the time by monitoring temperatures in different parts of your house, and increasing or decreasing levels to suit. • Monitoring your home’s performance and power consumption will enable you to control the amount of power you use and money you save. With a simple check of facts and figures you can decide when to turn appliances on or off and take advantage of lower power rates, and make changes to your automated settings for heating and lighting. • Econx can connect to any meter or solar power inverter that has a pulse output. The system will graph solar power usage or performance and even provide automatic switching, depending upon the amount of power you’ve generated (available 2018).